Enter the Coliseum is a 6 Mana Cost Epic Paladin Spell card from the The Grand Tournament set! Destroy all minions except each player's highest Attack minion. Rating: 3.1/5. From 87 votes. 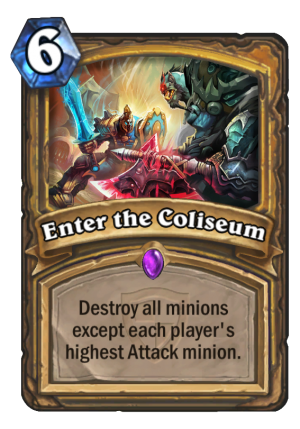 In case of a tie, Enter the Coliseum randomly chooses one minion from each side to survive. Back for another paladin card! Ok, so here we have what could be an AMAZING card, one that could be used for either a mass AOE, or a clever 1 or 2 kills on a minion. Interesting mechanics, you can use the peacekeeping effect (like in aldor and humility) to play around with attack, for fun. Another interesting interaction is with taunt, you can assassinate a big minion by killing off the other taunts. 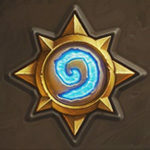 This is NOT for the new inspire like palidin, or even for current midrange, but HEAVY control Pali, as right now having a lot of minions out is common. All in all, a pseudo brawl effect, cool card, good card, just needs the right deck.